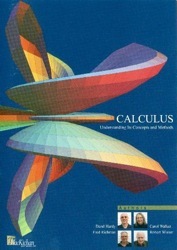 Calculus: Understanding Its Concept and Methods is a complete electronic textbook featuring live calculations and animated, interactive graphics. It uses the included Scientific Notebook® program to display text, mathematics, and graphics on your screen and to provide an interactive environment including examples with user-defined functions, animations, and algorithmically generated self-tests. This environment encourages a focus on mathematical problem solving, experimentation, verification, and communication of results.